Medicine seems to have gone awry in the US. The cost of care is mounting astronomically, making health care a costly luxury for some. At the same time, we’ve cause to wonder if modern medicine is safely practiced. The statistics are alarming: One out of every 500 patients admitted to a US. hospital is killed accidentally by their medical providers. That’s just the number of acknowledged mistakes. There are no statistics on the numbers of patients who die as a result of medical care consciously applied—from the "complications" of modern healing. What if this entire medical drama is folly? The billions of dollars it consumes, the pain patients often endure, and the disabilities and limitations we live with as a result of medical treatment—all nonessential to healing? What if in fact, the body is its own best healer? 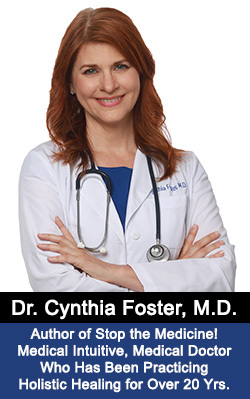 That is the contention of Dr. Cynthia Foster, MD. A trained medical doctor, Dr. Foster’s training forced her to face the fact that medicine often doesn’t heal. After suffering through her own health ills which modern medicine seemed unable to diagnose and cure, Dr. Foster was launched on a medical journey to find the center of true healing. What she found was that, through proper food and lifestyle, the body almost always heals itself.Armed with that new knowledge, and contrary to everything she bad learned about medicine, Dr. Foster did heal herself. Her book, Stop the Medicine, is Dr Foster’s testimony to her awakening to the dangers of medical practice as it is today, and the almost limitless possibilities of healing ourselves. Dr. Foster has stopped practicing modern medicine, and has begun a mission to share what she has learned about natural healing with the world. She recently contacted President Clinton to share with him her ideas about how legislation and government initiative can help to reduce the numbers of medical deaths in our country. Dr. Foster, you’ve written a book called Stop the Medicine. That’s surprising because most medical doctors want to start the medicine. Why "Stop the Medicine?" Well, "Stop the Medicine" because I had an experience seven years ago that totally changed my life. It totally changed my beliefs about modern medicine. Seven years ago I entered a state medical school, with aspirations of becoming a radiologist. And I had every intention of practicing the kind of medicine where you give drugs, vaccines, injections, do surgery and radiation. But the problem was that my body didn’t agree with me, and my health started breaking down. I didn’t know at the time that a certain thyroid disease called Graves' disease ran in my family, which is a disease that affects your thyroid. I began to have very alarming symptoms that caused me to become very debilitated, and I was in an extreme amount of pain. I was close to dying from this disease. I had full-blown epileptic seizures, horrible chest pains. I had incredible migraines. I had asthma attacks daily. And for all the medications that I was taking, I was getting worse and worse. And, I was suffering side effects from medications. Every time I went to my doctors, they told me that there was nothing that I could do. In response to the symptoms that I had, one doctor suggested that I had something called panic disorder, that I was just having anxiety attacks. I went through the system, and I took the medications, I saw a psychiatrist, I did everything that the doctors told me to do, and the only problem is that I got worse. So I began to question the medications, to question the medical theories. I walked into a health food store, and I started reading about the things that I could do, because I was feeling way too much like a victim. I wanted to take things into my own hands. What I found was an entirely different world exists out there, where people are healing themselves from diseases. Not just colds and flu and arthritis but really serious diseases like seizures, cancers, Parkinson’s disease, Alzheimer’s disease; very serious diseases were being healed with natural healing. So I embarked on a journey to discover what natural healing could do for me. What kind of a natural healer? supplements, she completely changed my diet. I was taking a barley grass powder, I was taking antioxidants, I was taking essential fatty acids, and I was not eating anything processed. I avoided any sort of refined sugar, refined flour, wheat, red meat; I was not allowed to have anything processed. I thought after my first consultation with this woman, that she was absolutely a lunatic. But then I began to talk to her patients; her waiting room was full of people who only knew of her by word-of-mouth, because all of their friends and relatives had been healed by this woman. I saw all sorts of people with cancers who she healed right in front of my eyes. So it wasn’t just reading about diseases that was going on, I was seeing things in full view, in real life; I was seeing diseases healed. Then I began to heal. And I began to regain my functions. And, I had been very bad off. The seizures were so bad that I was losing my ability to speak and understand people. So, when I began to heal, it was nothing short of miraculous. So I had to question the authorities in order to save my own life. The response that I got from the doctors for following this program was that I was seeing some sort of quack, and that I should immediately stop drinking carrot juice, and stop taking all of the supplements. (Part of my program involved fresh vegetables and fruit juices, and I really credit them with my recovery.) (For more info about juicing, read the article: The Power of Juicing. Yes. One of the biggest things that contributed to my recovery was carrot juice. The thing about healing in a natural way is that your body starts to clean out all the toxins that have been accumulated. Things like heavy metals, pesticides in the foods that we eat now, gallstones, cholesterol accumulations, fat accumulations, all sorts of chemicals from household cleaners, hair sprays, paints, gasoline fumes, the lead in the air from gasoline, industrial waste, and all sorts of pollutants in our environment. What I was learning was that you can clean all these out with herbs and natural healing, and so it was quite shocking to me. There I was in medical school and I was learning that diseases were incurable, and I wanted to say something, and I wanted to tell my professors that I’ve seen people healed. But, every time I tried to talk to a professor, or even one of my peers in medical school, they laughed. They said, "That’s just not possible, that’s quackery; you’d better be careful." Of course, I was trying to reason with doctors who have been taught from day one that nutrition makes absolutely no difference at all in your health. I was taught that alternative medicine was quackery, that it was dangerous, and that it was the doctor’s job to save people from these alternatives gone wrong that can seriously injure people. By the time I graduated from medical school, I was healed of the Graves disease, and I knew that it wasn’t a fluke. I knew that what happened to me could happen to anyone. And, for that reason, I knew that I could never be a practicing doctor. I knew I could never give medicines, I knew I could never write a prescription. Because what I saw was that every time a doctor wrote a prescription, people experienced side effects. Or they got worse. Or they had to have another medication because of the side effects of the first. And then they had to have another medication on top of that. And so, I saw people slowly getting worse and worse over the years. And when I walked into the office of natural healers, and I went and I visited so many of them across the country to figure this out for myself, I saw people getting better and better. So I became a natural healer. And I counsel people on how to take herbs and what foods to eat, and what foods not to eat, and how to clean out their bodies. And what I found in my own experience of counseling people was that people always improved. We’ve been so brain washed, from the time we were little toddlers, by the media, by the doctors, by everyone we talk to, that nutrition makes no difference whatsoever. And that we should all just leave health to the experts, people who know what they’re doing, people who’ve studied this for years and years. Medical doctors have some of the worst health of any group of the population in the country. In fact, the average age of death is 20 years sooner than the rest of the population. My personal theory is that it's because they’re taking their own medications. Also, they have very high stress levels, and their diet is so poor simply because most doctors live out of vending machines. In 1998, the state Department of Health, investigated New York state hospitals and found that over 60% of surgical residents were working over 95 hours per week. If this is the six-day workweek, that's about 16 hours a day. Of course this is another one of the problems of medicine is that, during the training, we teach doctors how to ignore their bodies. And we teach them to push the limit of their bodies. Then they make mistakes in their patient care. We're asking people for advice on longevity, from people who are very unhealthy and who don’t live as long as us. Then in April of 1998, we also found out from the Journal of the American Medical Association, that around 100,000 Americans are dying each year from medications that they took correctly. This is not even from medications that they took wrong, or from interactions of that medication with another one, and that study didn’t even include people who died at home. And of course we didn’t count the 90,000 people dying every year from hospital infections. That study in the Journal of the American Medical Association, which was in the same month, showed that up to 2 million people a year are getting these infections that are serious enough to require major medical intervention. So, according to my calculations, I’ve determined that over 300,000 Americans are dying every year from medical intervention. So, now it becomes life and death. And, that’s why I wrote Stop The Medicine, because people are literally dying in droves from medical intervention. In fact recently I came across, on the CDC’s web site, the Centers for Disease Control, in Atlanta GA, and their data shows that if you are an American between the ages of 1 and 35, your No. 1 cause of death is the medical profession. They call it "unintentional injections and adverse effects." And, one of the reasons that I wrote such a shocking book was because, if people don’t realize how they’re dying, they’re just going to continue believing everything that they see on TV and in the media. I’m all in favor of surgery if it saves someone’s life, but there are so many surgeries out there that are totally unnecessary. Take for instance, many people come to me with gallstones, and of course, the medical treatment for that is the removal of the gall bladder. In natural healing, we know about something called a liver flush, something so simple and basic you can make it in your blender, with citrus juice and olive oil that will flush gallstones out. Several years ago, my mother told me she had gallstones, and she didn’t want to have her gallbladder taken out. I said "Well let’s try this liver flush." I wasn’t even expecting it to do anything; a lot of doctors say there’s no way you can flush out gallstones, the bile duct is too narrow, they will never fit through. She tried some liver flushes for about a week, and she flushed the gall stones out. And she still has her gall bladder. And, she is still taking herbs, and getting healthier every day. So you were able to move that knowledge back up the generational ladder too? That’s what I really am hoping to do. I want people to know that they have a choice. And, I’m not even telling people that they have to choose natural healing, but I really feel like it’s everyone’s right to care for their body the way that they choose. And the problem is, that the medical profession has not allowed this to become a reality. They imprisoned natural healers for things like practicing medicine without a license. I’ve known medical doctors who’ve gone the natural route, and they’ve lost their licenses, or they’ve been raided by the FDA, for reasons that were totally ridiculous - things like using vitamins. 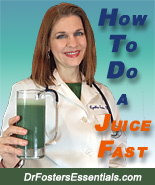 Or, teaching someone how to do a juice fast. This is one of the reasons why the medical profession is in power, is because they’ve made sure with their money that they have silenced any sort of objections to their system. Clearly you didn’t grow up viewing health in this way. Was there one event that happened to change your perspective? I can pinpoint two events. One event totally changed my perspective on medicine. It happened when I was in training. A man came into the hospital with heart failure, and he had fluid in his lungs. What doctors usually do in that case is they stick a needle into the patient’s lung, and they drain the fluid out. I was learning how to do this procedure for the first time, and a resident was teaching me how to do it. I stuck a needle in this man’s back, and the fluid started draining out, through a tube into a glass bottle on the floor, and the resident said "This procedure’s going very well, and I’m just going to go and catch up on some paperwork." And she left the room, and about 30 seconds later, the man started screaming in pain, and he was gasping for air. I was in training, and I had no idea what was going on with this man. But, I knew that wasn’t good. When the resident finally returned they took x-rays and discovered that his lung had collapsed. When your lung collapses, this is something that we call a complication. And, complications are something that we, the medical profession, deem unavoidable. So this complication cost this man several days in the hospital, thousands and thousands of dollars, and he had to have a chest tube inserted into his lungs to reinflate his lungs. And this is a surgery that is incredibly painful. So, it wasn’t just, "Oh, it’s just a complication", this was something major that happened to this man. And of course, when I learned about this procedure, I knew that that was a possible complication. But, that so affected me... I felt like I hurt somebody. And, I could not take it. I could not take it that I had hurt another human being. And, I vowed that I could never do that to anyone ever again. It wasn’t just that procedure. It was everything that had to do with medicine. I vowed I could never do that to another human being. I could never have that responsibility of hurting someone that way. Was when I had the "anxiety disorder" and I would sit across from the doctor and I would say, "I think there is something seriously wrong with me." I was tuning into my body and I knew that something was wrong. But the psychiatrist over and over and over again kept saying, "No, you just have this mental disorder." He kept telling me not to listen to my inner voice, and not to pay attention to any of the symptoms that I was having. I realized that doctors really are not interested in listening to what a person has to say. They’re more interested in proving that the person has this or that disease, according to some sort of laboratory tests, or according to their symptoms. It’s so much easier for them just to categorize a person, and give them a certain drug that targets specifically that disorder. And, once they’ve done that, they’d rather the person just shut up and take their treatment. There are all kinds of articles in the medical literature that talk about patient compliance, and whether the patient does what the doctor says, and if they don’t do what the doctor says, they’re bad patients, and it’s their own darn fault for not getting well because they didn’t do what they were told. I came to realize that the most important resource that we can utilize to get ourselves well is ourselves - just listening to that inner voice. I realized that going to a doctors office is very disempowering, and that nobody wants to listen to that inner voice. What is the goal of these practices. Just what is the definition of health? So many people have a definition of health that I think is not very healthy. For instance, some people have crippling arthritis, but if they can walk across the room they think they’re healthy. Or, some people who have recovered from a heart bypass surgery, and if they can walk a block, they think they’re healthy. And one of the reasons is because every time an American walks into the doctor’s office, the doctor says, "Well, you’re basically healthy, and here, take this prescription, or take this antibiotic." And what the patient doesn’t realize is that, if they have to take any kind of medication at all, that’s a sign or signal from their bodies that says something is out of balance. Something needs to be fixed here. People don’t realize that the aches, pains, lack of energy, their headaches, their migraines, and their gastroesophageal reflux, all these minor complaints, are really beginning signs of disease. If those symptoms are not attended to, that toxicity level in the body gets worse and worse, until they get a serious degenerative disease. So, my definition of health would be that a person does not need any sort of medications, the person has a good energy level, can sleep through the entire night and get to sleep fairly easily, and has enough energy to exercise as much as they want, they can speak clearly, they can breathe freely... that would be my definition of health. Do you see a lot of healthy people? Most my colleagues are natural healers. They take care of themselves. And, whenever they have any sort of cold, or any sort of minor complaint, they take care of it naturally. They make sure to address what caused that cold. I don’t see patients anymore since I wrote the book. [Editor's note: Dr. Foster has resumed her consultation services.] And that’s an important point. So many doctors who go public with this sort of information are gone after by the authorities and the FDA. So, in order to protect myself, I stopped seeing patients. It was suggested to me that I do that for my own protection. It’s nothing that I really wanted to do, because I love seeing patients. I love teaching people how to get well. But in the interest of reaching many more people, I had to make that decision. I didn’t realize that these persecutions were frequent that you’d have to take precautions against them. Most of the natural healers that I know have ways to protect themselves, and they’re very cautious not to diagnose, treat, or say to their patients that they can heal them of anything. They say, "Well, you know, if your disease happens to go away, in the process of our trying to balance your body, then you know, that happens." You’d want to avoid having to go through that process of having to justify or defend yourself in court. I made so many sacrifices to get this message out, and the very last thing I want to do is to end up in court. I lost the opportunity of having a very lucrative medical practice. I lost the chance to practice with a natural healer because she wanted me to continue my natural training, and get a license; I couldn’t even do that. I couldn’t be a part of medicine for one more day. I felt like that many times. So, it was a very difficult decision for me to make. I wish there was a way in which you could still practice, because I think medicine needs the compassion that you’re expressing. It disturbs me that you’ve had to give that up - for our sake, as much as for yours . It is dismaying, but I really think that things are changing. The natural healing industry is growing at an estimated rate of about 20 percent per year. And, people are waking up to the powers of natural healing. The FDA is now going to allow vitamin companies and other supplement manufacturers, to make claims for their products, to a limited degree. This is a good beginning. And I really feel, as more and more people know and understand that natural healing works, they will begin to demand it. And it’s already started to happen. It seems the medical profession has gone astray, it’s almost industrial now. You know, I think sometimes patients are looked upon as objects, more than people, to certain degree. You know, that is true. If you think about it, the practice of medicine is so invasive, and it’s so painful sometimes for people, that doctors really have to pull themselves away, they have to detach themselves, otherwise they get way too emotionally involved, and they would get very very upset. Surgery is very upsetting. My first day of gross anatomy was very upsetting. Most people had nightmares when we first began, there was counseling where I went to medical school, because it can be very emotionally intense to deal with diseases this way. You know, cutting into a living body is pretty intense, and knowing that someone’s life is in your hands. What is the primary factor that gets in the way of people healing themselves? The number one factor I’d say is that people have been taught to think like victims, that diseases are random and happen out of nowhere. That’s just not true. Diseases are created by the way that we eat, drink and live. If we’re born with something, it was caused by the way our parents were living, and by what foods they were eating, or what chemicals they were exposed to. Just because a person has something genetic doesn’t mean that they can’t heal that. We’re taught to think that we’re just victims, that we should just sit back in our chairs and take our injections and our pills. This is the most damaging thing, because people do have the ability to heal themselves. What do people need to do to live the kind of healing life that you’ve come to discover? What’s your prescription? The number one thing people should concentrate on is their elimination. Medically speaking, when we raise cells in a culture, in a nutrient broth, if we don’t change that broth every day, then the waste from that cell accumulates, and poisons the cell to death. In the same way, if people do not eliminate after each meal that they’ve eaten, waste backs up in their systems. It can severely poison them and cause all sorts of diseases that doctors have all sorts of fancy names for, and will tell you are incurable. The very first thing I always did, with any sort of person who came in to me for help, was to tell them that they need to get their bowels moving. And drink lots of water to get their kidneys working and moving. So, elimination would be number one, and number two would be nutrition. And, for nutrition, my personal slant on that is that a vegetarian diet is the best. By vegetarian you mean vegan? Studies show that vegetarians live longer, even if you’re a lacto-ovo vegetarian. But if you’re vegan, studies show that you live even longer. Dr. Dean Ornish, Dr. McDougall, and Dr. Klaper have all done lots of work in that area. Dean Ornish has shown that 95 percent of the time he’s successful in reversing heart disease. You have to remember that his patients were so sick that they couldn’t even have the surgery because it was too much of a risk. When I made a dietary shift to vegetarianism, that was when I noticed the biggest change in my body, in my functioning. So, number two would be nutrition, and number three would be supplementation. Greens are extremely important, especially because of the quality of the soil. Do you mean Spirulina and algaes? Spirulina, chlorella, blue-green algae, wheatgrass, barley grass, alfalfa—all these greens are wonderful for rebuilding the body, and I’ve seen miraculous results with people that had anemia being helped by these greens. They’re high in calcium and potassium, they rebuild all the structures in your body. People report that with the algaes that they get a mood elevation, they have a sense of well-being, they can concentrate, they have more stamina. The next, I would say would be, a cleansing program, a cleansing and detoxification program. Make sure that your intestines are functioning at the proper rate, and in the proper way. There are herbs that will rebuild your intestines, that will stimulate them to move naturally without causing you to become addicted to some sort of laxative. Which probably brings me to my next point, which would be, to eliminate as many chemicals as possible from your environment. When I read labels on chemicals in a regular grocery store—let’s say laundry detergent, or drain cleaner, or just household cleaners or abrasive cleaners— sometimes there’s a skull and crossbones on there. Sometimes we see people in the emergency rooms for things like that, for toxic exposures. Minimize your exposure to these sorts of chemicals. Everything you use you can inhale. So people with lung problems can inhale all the chemicals that they’re using just to clean their house. What about chemicals on food? You know, the reason why these things work as pesticides is because pests are killed... they’re so small, their metabolisms are so fast that they’re killed a lot sooner than we would be. So the effects of these pesticides take a while to manifest themselves in people, but usually the way they do show up is neurological diseases... things like MS, Alzheimer’s disease, diseases of brain functioning. Diseases that seem almost epidemic these days. Right. So eat organically grown food as much as you can. The next point would be to become your own advocate. Become the master of your own destiny. Make your own choices, listen to your own wisdom, listen to your intuition. Several times when I was sick, at a certain feeling that I should take a certain herb, or go on a juice fast, and I went ahead and followed it, and it worked. Be in charge of your own health, and your own body. Teach and educate yourself to learn more. Because what I find is the more people get into natural healing, the more they learn, the more they get involved, the healthier they get. I’m not even going to say there’s one therapy out there for people to do. When you do a lot of them, and you incorporate them into your life, you just can’t help but get healthier. Partially because you’re just taking control. You know, the medical profession says that the placebo effect is as high as 30 to 40 percent. What we do know is that natural therapies are not hurting people. What we do know is that the medical profession is harming people; medicines are harming people. 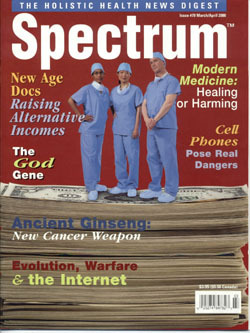 Would you go so far as to say that traditional mainstream medicine doesn’t work? If I’m in a car accident or something, and I broke my arm, or I have some trauma, I would probably go to the hospital. Of course, I would take my herbs with me. I would have lots of cayenne, and greens, and put essential oils all over me to speed up my recovery. There are certain circumstances when a person probably should go to the doctor. They are very good at trauma medicine. What kinds of changes would you like to see immediately in the medical profession? I would like to see any sort of positive changes in the medical profession, which is why I wrote a letter to President Clinton suggesting different ways that hospitals can change in order to save lives and reduce mistakes and medical errors. Things like, introducing a "humor" room into the hospital, where people can go to watch funny movies. When people laugh, they stimulate their immune systems, they get well sooner, they get out of the hospital, and the quicker you get out of the hospital, the less likely it is you're going to pick up an infection. Things like, cutting down the hours the doctors are supposed to work so they don’t make mistakes. Things like, mandatory hand washing—putting signs all over the place that say "wash your hands." Some studies show that up to 70 percent of the time doctors and staff are not washing their hands after every patient. Another of my recommendations was mandatory drug testing for anyone who does surgery. You would be amazed. Sometimes there are impaired physicians even on drugs! And they are making life-and-death decisions. We can’t be surprised when they make mistakes and people die. It’s probably going to be hard to convince a profession that’s in denial that they need to make changes like that. Well, I think it’s going to happen, and going to happen very slowly, and I think that what's going to happen is as this knowledge spreads, is that doctors who are desperately ill—and this has already started to happen—are starting to turn to those methods. And when they find those methods work, they start changing their minds about health. Even the doctors know that they’re not getting the results that they need from the medicine that they’re practicing. Well, who wants to suffer and die? I would have done anything seven years ago to save my own life. That involves trying something new, trying something everyone else thought was quackery. Desperation is a good thing. It forces people go outside of their normal routine. It really helped me grow as a person and I really think that more and more doctors are going to catch on.